Arthritis Management Can Include Yoga - Training Day Fitness, Inc.
Of the many different kinds of yoga, Hatha yoga is considered gentle. The different gentle body poses are coupled with breathing and relaxation techniques. Because Hatha is gentle, it is recommended for beginners and those with limited physical ability, such as arthritis patients. 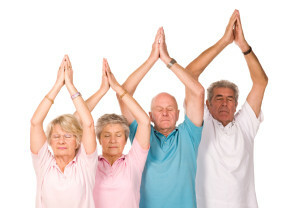 Recent studies in the US and Canada showed improvement in pain and well-being in rheumatic patients who practiced yoga. Improvements in mood, relationships and sleep were also reported by the people in these studies. The authors of this study reviewed several published yoga studies. Susan J. Bartlett from the Division of Rheumatology and Clinical Epidemiology, McGill University in Montreal, Canada and the Division of Rheumatology at Johns Hopkins University in Baltimore, MD, was the lead author. Answers to the 2002 National Health Interview Survey Alternative Medicine Supplement showed that 79 percent of people who practiced yoga were women, 85 percent were white and 50 percent had a college education. Of the survey participants, 95 percent of the people who practiced yoga said their health was excellent to good, while 87 percent of people who did not practice yoga reported that. Over 60 percent of survey respondants said they had a muscle or bone condition. In 2011, a review of studies done on elderly adults practicing yoga concluded that yoga was related to a moderate improvement in walking, flexibility, balance and strength in the lower body. Practicing yoga was also associated with weight loss in this group of people. Another review of studies where yoga was performed by people who had 13 different health conditions showed a 26 percent improvement in pain, a 20 percent decrease in disability due to pain and a 35 percent improvement in mood. In a different study of 75 adults with osteoarthritis or rheumatoid arthritis, research participants were assigned to either eight weeks of yoga or usual care for their condition (no yoga). People assigned to the yoga group took two one-hour gentle yoga classes a week with one yoga practice at home during the week. When the study was over, the people who took yoga classes reported better physical health and mood. They also showed improved balance and flexibility. Another study of yoga versus no yoga was performed in a group of 57 patients with lupus — an inflammatory disease that can affect organs throughout the body. Improvements in stress and pain management, wellness, relationships and sleep were reported by the group assigned to gentle yoga classes. It is difficult to compare the results of some yoga studies because they either studied too few patients, the study subjects had too many different conditions, the same results were not measured or the yoga classes were not all the same type. This study was published in the December edition of Current Rheumatology Reports. The main author, Susan J. Bartlett, and co-author Clifton O. Bingham III disclosed that they received grant support from the National Institutes of Health (NIH) and the Arthrisits Foundation. Dr. Bartlett also served as a consultant for the Arthristis Foundation. Co-author Steffany H. Moonaz received pre-doctoral supportd from NIH and was a consultant for NIH and the Arthrisit Foundation. Co-authors Christopher Mills and Sasha Bernatsky reported no conflicts of interest.